Idiappam is a tasty South Indian breakfast, steamed and healthy food. 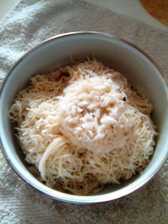 It is also referred as Nool Puttu. In Tamil Nadu it is called as Sevai. This mouth watering recipe is made of rice flour, and easy to prepare. 2. Hot water - 2 cups. Soak the rice in water overnight. Wash and drain it completely. After drying, pound it to a fine powder. Add hot water slowly and carefully, stir it with a laddle to make a smooth dough. Once you are able to mix it with your hand, use the hand to check the proper consistency. Make a ball of the dough and fill it half of the idiappam maker/murukku maker. Keep the idli maker or a pressure cooker on the stove with 1 1/2 cups of water. Sprinkle some coconuts on the idli mould. Press the murukku maker slowly, over the idli mould where the coconut is sprinkled. You will get thin layers of the rice flour collected on the mould. Use the whole dough in this way. Sprinkle some more coconuts over all the idiappams. Keep the idli moulds in the idli maker or the pressure cooker and steam it for just 3-5 minutes. If you are using the pressure cooker, do not use the weight on it. Remove them from the stove and slowly take them out one by one from the idli moulds. Enjoy your Nool puttu with any of the following - stew, egg curry, sugar and milk, or just sugar. Note: You can also use the ready made rice flour, if it is available in your area. In most of the Indian stores the rice flour will be available.If you want to reduce the quantity of coconut, use it only on one side, at the bottom or on top.While making the dough care should be taken not to make the dough very hard. If the dough is hard it will not pass through the sieve. If it is very loose, the dough will not pass through the sieve properly. In that case a bit more powder can be added.